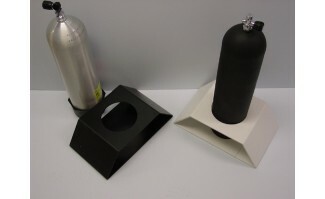 Our black expanded PVC tank stand is made to hold in place a tank for display for virtually any scuba tank. You can add a price or any information on the angled front and back pieces, but we do not ship with a price tag molding as a standard. Made in the USA.